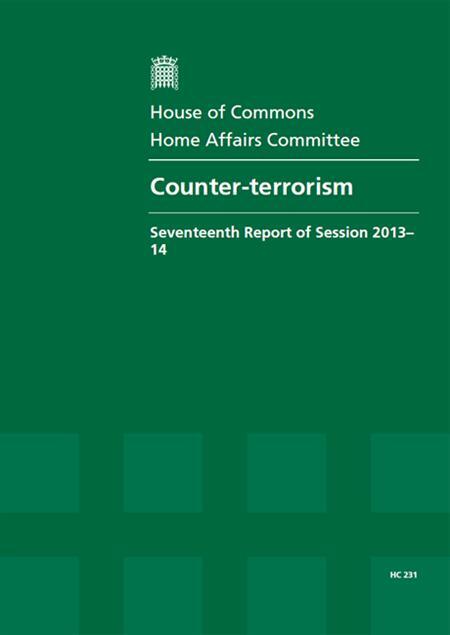 The report 'Counter-Terrorism (HC 231)' examines the future of the UK's efforts to address the threat of terrorism. Recent events involving Boko Haram, Al-Shabab and Al Qaeda show that the terrorist threat to the UK is as grave as at any point in the past thirteen years. Interpol have the resources and experience to build a platform to counter the terrorist threat, and the UK must take the lead in bringing others to the table. However, ensuring public safety cannot be the sole purview of the counterterrorism command and the security service, it is a responsibility in which all UK citizens and companies take a share. Stopping British men and women going to become foreign fighters, in Syria and other theatres of conflict, and engaging with them when they return is vital to avoid endangering the security of the UK. Whether in classrooms, local community centres, or through the global reach of the internet and social media, a clear message needs to be sent to those at risk. The agencies are at the cutting edge of sophistication and are owed an equally refined system of democratic scrutiny.